I started a new journal Sunday. It’s not necessarily a daily journal, where I write every day. It’s more like the Commonplace Books of old, a place to collect eclectic bits. Little pieces of inspiration. I take my book to church, conferences, speeches – anywhere the spoken word might provoke an idea. I take notes on sermons, speeches... and I flip to the back to record those spur-of-the-moment ideas, too. Looking back over the last several pages of my journals can be pretty inspirational for me. As I peeled the plastic off the pretty journal, I was struck with the promise of it all. All those blank pages – such possibility. And you know what? It’s true with life, with family, with our children. We really have no idea where anything is going to take us – not if we open ourselves up to the Creator and surrender to His leading. I’m seeing them. The prop room and the blank pages of a journal are only a start. What a powerful prayer - "Make me content, Lord. Whether on the move or in the same place right now, show me the possibilities." So many of us try to look for the possibilities in ourselves and ignore the fact that God has a plan and many more possibilities than we could imagine. I love this post! My 15 yod has been keeping a commonplace book for several years now! I can't wait to hear more about the book! Content, isn't that just the opposite of what our culture teaches? I think that's why it's so hard for us and our kids. Great post. When I read this, I got my idea for tomorrow's 31 Days post -- love the thought of promise, of the unknown, of the hope story that God writes on our pages. I, too, love the promise of a new journal. So well put. And your prayer is great. Thank you for sharing it! Laura! I "finished" my journal on Sunday and have a new blank book to write in one day this week. 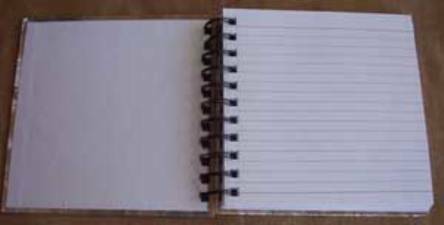 I love your concept of a commonplace book and want to start one. But I HAVE to keep a journal. I love fresh starts of all kinds . . . and a new journal is one of my favorites.